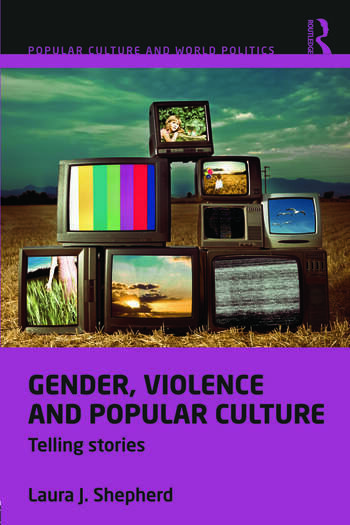 This book examines the intersection of gender and violence in popular culture. Drawing on the latest thinking in critical international relations, media and cultural studies and gender studies, it focuses in particular on a number of popular TV shows including Angel, Buffy the Vampire Slayer, Firefly, Generation Kill, The Corner and The West Wing. The book makes a unique theoretical contribution to the ‘narrative turn’ in International Relations by illustrating the ways in which popular culture and global politics are intertwined and how we make sense of our worlds through these two frames. Methodologically, the book enhances discourse-theoretical analysis in IR through its incorporation of methods from narratology and film studies. The book proposes an aesthetic ethicopolitical approach to global politics which challenges us to interrogate how it becomes possible that we think what we think, it challenges the truths that we hold to be self-evident and that which we take to be common sense. It demands that we think carefully, critically, uncomfortably, about our world(s) – even when we’re ‘only’ watching television.